Q ’ how do you plan to power this setup… battery / solar or a combination ? The less data you transmit, the longer your setup will work on a battery, thats why its important that you processor goes to ‘sleep’ in between transmissions. So you figured that out yet, ultra sound /weight / light , how do you trigger a transmission ? I don’t know how often these ‘chicadees’ will enter your setup, but its probably better to think of a system that collect data during a certain time , format that data and transmits in a clever packet once an hour/day whatever and not everytime a bird comes in. Oh, actually, the image shows two packets. Also, they might be anyone’s LoRa transmission if they’re not yours. Given the first bytes, 0xDA985AA0 and 0x66A58D15 I don’t think these are LoRaWAN uplinks. The CRC_BAD indicates problems also. Anyway, we need to see the code, and know what you see in TTN Console. 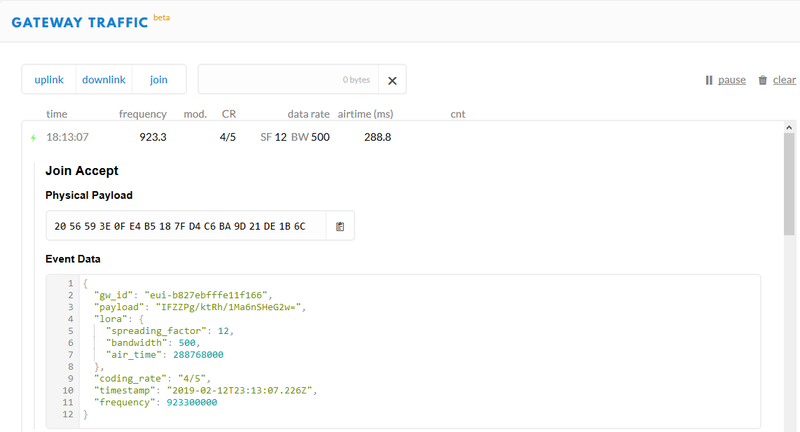 Did you register the LoRaWAN device in TTN Console? We registered our gateway, not the node. In order to see the Decrypted message does each individual node need to be registered to the TTN console? 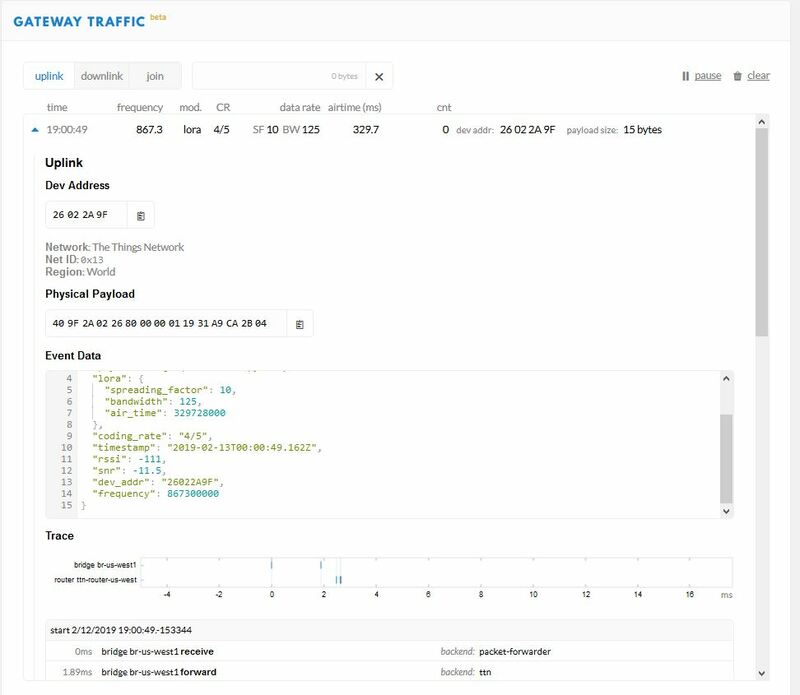 So: what are you seeing in TTN Console in the gateway’s Traffic page, and in the device’s Data page? And what code are you using to create the payload? We see nothing, so far we have not gotten any traffic from the gateway, even though we have been logging packets from the nodes. Leading me to believe its because the packets being sent using this repo are not using the LoRaWAN protocol. From our last development meeting we assumed that the rpi-lora-tranceiver repository was the reason we were not able to see any traffic on the TTN. Leading me to shift to using a new repository for our nodes. I am somewhat positive that this repository: lmic-rpi-lora-gps-hat will allow us to register our nodes and send out LoRaWAN protocols to our GW. Have you ever worked with this repository? The date/time does not need to be extremely accurate, so I’d guess that the time your receive the packet suffices? All you really must send are the RFID tag value and the weight. But again: don’t send those as plain text. Like if reading the tag gives you some EUI in some hexadecimal text representation (using 2 characters per byte, and maybe some dashes? ), then you could send that as true binary values, one byte for each byte. Thank you for these suggestions! I totally agree with them and will present them to the group. Really appreciate the help. For right now we are going to use a 12V battery to power these setups. We plan to only have them collecting RFID tags from sunrise to sunset using a daylight sensor. We are considering implementing a solar trickle charger that will use the power it collects to slowly recharge each one of our batteries. Using the solar trickle charger will not keep each battery charged continuously but it will extend the time in which our setup will be running. We have been discussing this for some time now. The professor who initially brought us in to work on this project wants the updates to be as fast as possible, ideally instantaneous. We explained to him that in order to achieve that it comes down to the power supply we choose to implement. With the batteries we are using we will be able to get 7 to 8 days running this setup for 12 hours a day at idle. That being said we are still trying to find the best way to send the data while still being conscious of our battery consumption. We are leaning towards logging each RFID tag into a file that we only transmit a few times each day. Or possibly every hour. That is still to be determined. Although I do have a general question. When we started out this project we were planning to use raspberry pi 3’s for our host device on each node. Once we began considering power consumption it became obvious that the raspberry pi zero W is a better option for us to go with. although someone just brought to my attention that the raspberry Pi Zero W is single core and will not be capable of running multiple programs at once. Is this true? I dont believe that it is from what I have been reading on other forms but can anyone confirm if this is true or not. The reason this would be a problem is that in order to use our current setup we need the LoRa program (whatever program that will be responsible for transmitting our data) and the Master Code program ( the main program that will be running to control the RFID reader and collect the data from the read tags to be pushed to a log file for transmission) running at the same time. In order to see the Decrypted message does each individual node need to be registered to the TTN console? Without registering the devices (and an application for the devices) you should still see the packets in the gateway’s Traffic page in TTN Console though; you should even see packets for non-TTN users. But given the CRC_BAD errors, I guess you should indeed focus on the gateway. I’ve not worked with your hardware. (And again: keep a few meters, say 10, between nodes and gateway.) Maybe post a longer log? we need the LoRa program (whatever program that will be responsible for transmitting our data) and … running at the same time. The professor who initially brought us in to work on this project wants the updates to be as fast as possible, ideally instantaneous. You might also run into Limitations: data rate, packet size, 30 seconds uplink and 10 messages downlink per day Fair Access Policy then. Oh, and show us some code! This is true, but is it still possible to run both at the same time? We plan to only activate our LoRa board a few times each day in order to save power, but when we start transmitting the LoRa packets will we be able to continue reading tags with our “master code” program running simultaneously alongside the LoRa program? Actually I wonder if you even need a Pi. Maybe some ESP suffices already, but that depends on the software you need to read that RFID tag and to get the weight. depends on the software you need to read that RFID tag and to get the weight. Its just a simple python program. Same thing for the Weight sensor. But right now we are just using the RFID sensor until we are able to get everything deployed and verify that its a functioning system. Once that happens we will calibrate and begin reprogramming the weight sensor to start functioning. I attached the entire code file but I am pretty sure this is the only part you need to see. Its the portion of the code where you can change what the payload is, set the freq, SF, and channel. …so you’re still using some peer-to-peer bare LoRa software for the device? 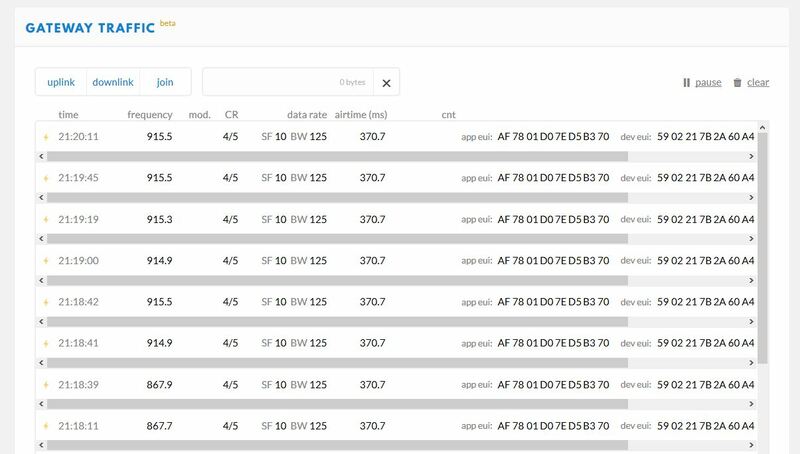 You’ll need some LoRaWAN library for the device/node, in which you will also need to configure the device’s DevEUI, AppEUI and AppKey (for OTAA) or DevAddr, NwkSKey and AppSKey (for ABP). Leading me to believe its because the packets being sent using this repo are not using the LoRaWAN protocol. Haha no worries. We are meeting tonight to work on it as a group, hopefully We are able to make some progress. Successes! we were able to receive packets on the TTN console! Now that we have gotten packets sent to us from one of our nodes. We are attempting to change the payload to unique values. Nice. Your next problem: you’ve got the AppEUI in the wrong order. And you might have made the same mistake for the DevEUI. You’re seeing OTAA Join Requests, but TTN does not recognize these values and does not create an OTAA Join Accept. You were right about the keys being switched around. We got those fixed and have now successfully got a join accepted. The nodes have been seen by the TTN. But we are not able to see any decoded data. How do we actually see the data? When an OTAA Join succeeds then you’re sure that the configuration is okay. Next, if the device is transmitting any data, and one or more gateways receive that, then you should see the decrypted application data in both the application’s Data page and the specific device’s Data page in TTN Console. You should also see the full LoRaWAN packet in the gateway’s Traffic page (if one has access to that, which you do), which includes the encrypted application payload (plus the LoRaWAN header, the MIC and possibly some MAC commands, all shown as a single sequence of hexadecimal values). So, is the device sending any uplink at all, after the join? If you define a Decoder in the application’s Payload Format, and if that does not throw any errors, then TTN can also decode the application data for you, and show that on the same Data pages. We have not defined a decoder, no. We are looking at the ‘integration’ tab though. From what we can gather, if we were to setup an http integration then we would be able to send the (decryped)data directly to wherever we determine, right? Does the decryption only happen if we define a decoder in the applications payload format or through our own application. I guess what I am asking is if we decide to setup an http integration, would that handle the decryption for us or would we need to define it in the payload as well? this is an example of an up-link we received after the join. We also noticed our RSSI is very low. This might be because of the building we are testing in. This particular packet was sent from a node located approximately 30 to 40 meters away. Although we are right next to a massive cluster computer, which I assume would probably interfere with the signal strength. We are planning to take our devices outside for a better testing environment. If you also define a Decoder then both the MQTT Data API and the HTTP Integration will give you both the Base64 encoded raw application payload, and whatever fields that are returned by the Decoder. We’ve been able to send configurable payloads, verified by a decoder. However, it seems that our maximum range is 2.5 feet for acknowledgements and payloads(uplinks). We’ve done multiple tests at 50 and 100 meters but to no avail. What troubleshooting steps do you recommend to fix the range?